The last step in the Close-In Phase (the shell) begins once the flashing is complete and the work area is ready to start cutting roofing panels. 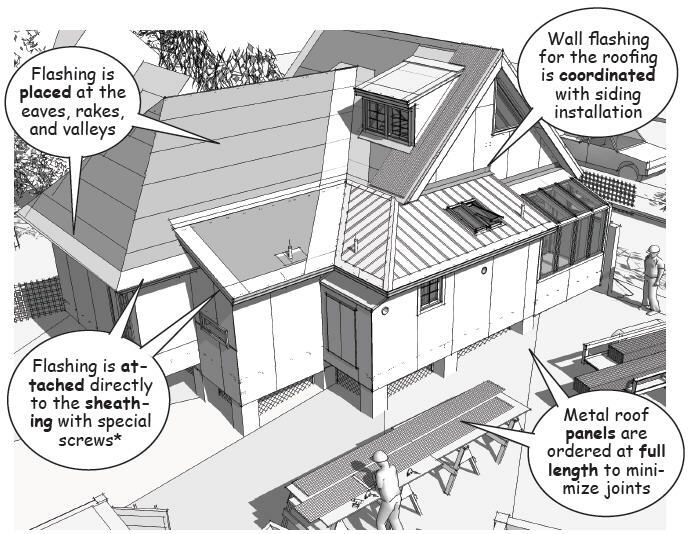 Metal roofing with concealed fasteners is considered by many to be more aesthetically pleasing, but there are applications when exposed fasteners are more practical. 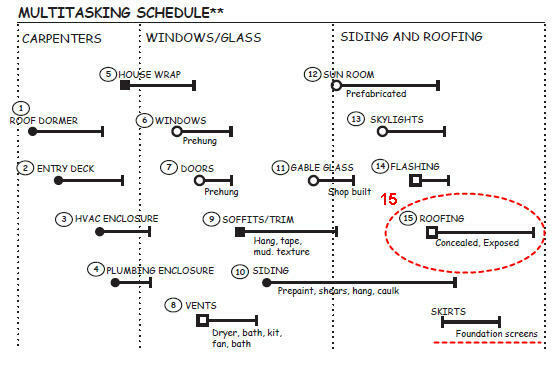 This includes buildings where additions or future changes are anticipated that will require removing roofing panels. 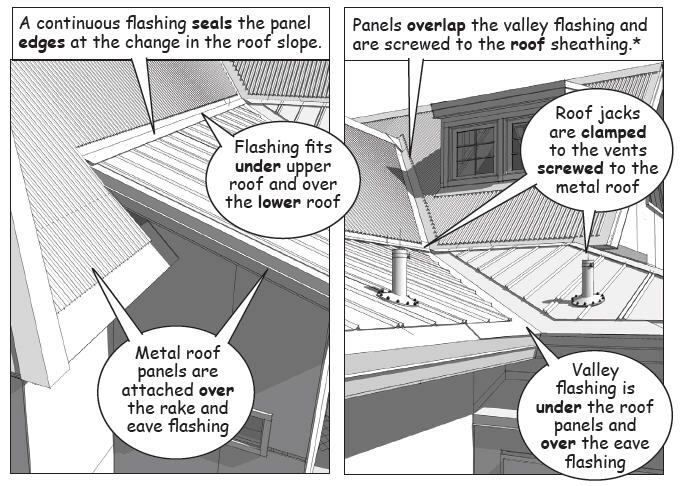 Metal roofing with exposed fasteners are also easier to install and require no special tools or hardware. 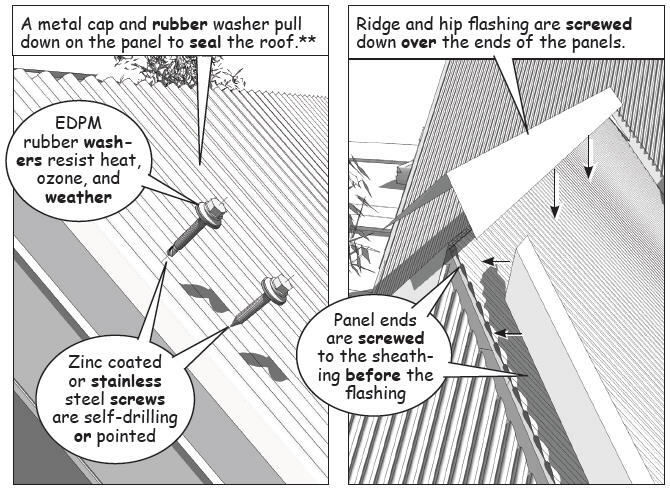 Once the underlying flashing is complete, the roofing panels are cut and mounted either directly to the roof deck or to furring strips laid over the temporary roofing membrane. When weather conditions are either extremely cold or hot, the furring strips create an air space that prevents direct heat transfer from the metal panels through the sheathing to the interior. This air space also helps to prevent heat loss from the interior to the metal surface that causes ice dams from melting snow. 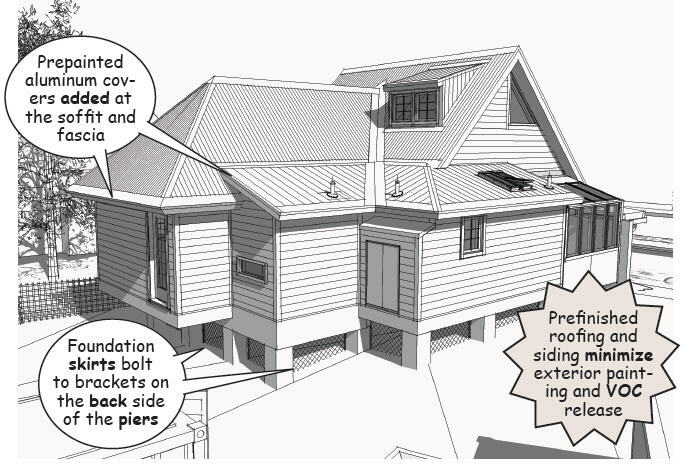 Rigid insulation is applied to the roof deck when batt or blown insulation is not installed in the attic or space between the ceiling joist and rafters. Special roofing screws with EDPM washers penetrate the high point of the metal roofing, spaced according to manufacturer specifications, and engineered to counter uplift from wind loads. The screws are long enough to secure the roofing panels, flashing, and the furring and rigid insulation, if used. Building codes require the screws to fully penetrate the roof sheathing so that the threads of their tips are visible for inspection from the interior. Once the roofing is complete, exterior finishes and sitework are finalized. This includes touch up for prepainted trim, siding, and flashing as well as finish sitework, landscaping, vents, screens, and skirts around the pier foundation. Sitework and landscaping that includes sprays, dust, insecticides, or other chemicals are always coordinated with the interior subcontractors to prevent contaminants from entering the building. “NO SMOKING” signs are also posted at all entries before the interior work begins.